Directions are for size Small (Child 6 - 10 years); changes for sizes Medium (Teen 12 - 18 years), Large (adult sizes 8 - 14), and Extra Large (sizes 16 - 3X) are in parentheses. Red Heart® Bright & Lofty™, Art. E725 (4 ounce/95 yard skein): 9 (12, 15, 18) Ounces CA. Red Heart® Super Saver®, Art. E300 (8 ounce/452 yard skein): 2 (3, 4 ½, 6 ½) Ounces CB. Adult: 9912 Licorice CA; 312 Black CB. Child: 9945 Bikini CA; 530 Orchid CB. Straight Knitting Needles: 9mm [US 13]. Circular Knitting Needle: 10mm [US 15] - 36". Yarn needle; 8 stitch markers. GAUGE: 8 sts = 4"; 12 rows = 4" in St st on larger needle. CHECK YOUR GAUGE. Use any size needle to obtain the correct gauge. Finished length: 13 (15, 16 ½,18 ½)". 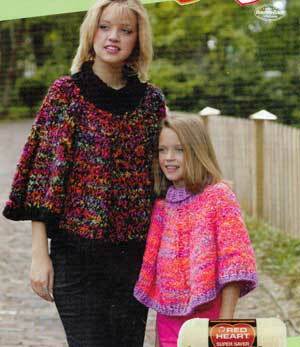 NOTE: Poncho is worked in 2 shaped pieces from the turtleneck down, then sewn together at side seams. Inc (increase) = K in front and back of next st.
Repeat Rows 1 and 2 for 5 (5 ½, 6, 6)", inc 1 (1, 0, 0) st on last row, end Row 2 - 20 (22, 25, 25) sts. Row 1 (Right Side): K1 (2, 2, 2), [P1, K1, P1, K2 (2, 3, 3)] 3 times, P1, K1, P1, K1 (2, 2, 2). Row 2: P1 (2, 2, 2), [K3, P2 (2, 3, 3)] 3 times, K3, P1 (2, 2, 2). Row 3: K 0 (1, 1, 1), [inc, place marker, P1, K1, P1, place marker, inc, K 0 (0, 1, 1)] 3 times, inc. place marker, P1, K1, P1, place marker, inc. K 0 (1, 1, 1) - 28 (30, 33, 33) sts. Note: Slip markers as you come to them. Row 4: P2 (3, 3, 3), [K3, P4 (4, 5, 5)] 3 times, K3, P2 (3, 3, 3). Row 5: [K to marker, P1, K1, P1] 4 times, K to end. Row 6: [P to marker, K3] 4 times, P to end. Row 7: [K to one st before marker, inc, P1, K1, P1, inc] 4 times, K to end - 36 (38, 41, 41) sts. Repeat Rows 5-8 for pat 2 (2, 3, 4) more times - 52 (54, 65, 73) sts. Continue in the same manner EXCEPT increase every 6th row from previous increase (instead of every 4th row) 3 (4, 4, 4) times -76 (86, 97, 105) sts. Work a few rows even until piece measures 12 (14, 15, 17)" below neck rib¬bing, inc 1 (1, 0, 0) st on last row, end wrong side row - 77 (87, 97, 105) sts. Border: With a double strand of CB, work in ribbing, beg Row 1, for 1 (1, 1 ½, 1 ½)". Bind off in ribbing. FINISHING: Sew neckband and side seams, reversing uppermost half of neckband seam for turnover. ABBREVIATIONS: beg = begin(ning); CA, CB = Color A, Color B; K = knit; mm = millimeters; P = purl; pat = pattern; rep = repeat; St st = Stockinette stitch (K 1 row, P 1 row); st(s) = stitch(es); * = repeat whatever follows the * as indicated; [ ] = work directions in brackets the number of times specified.